SEATTLE – Opening day comes accompanied by its own built-in charms, of course, even when it happens at night. All those clichés about renewal and rebirth – well, corny as they are, you can’t help but feel it deep in your soul when all the pomp and circumstance is done and the game begins. And if the Make-A-Wish Run Around the Bases doesn’t move you, well, your heart is made of stone. For the Mariners on Thursday at Safeco Field, they fittingly had a familiar, complex symbol of enduring hope – and a tangible reminder of ongoing frustration – on the mound. And Felix Hernandez, entering a Mariners season in which unbridled optimism has been more elusive than normal, gave them all they could have wanted, and more, in a scintillating 2-1 victory over the Indians. Looking for some opening-day cheer to sink your teeth into? Seeing Hernandez prowling the mound in his customarily baggy pants, in full command for 5 1/3 innings, is a great place to start. 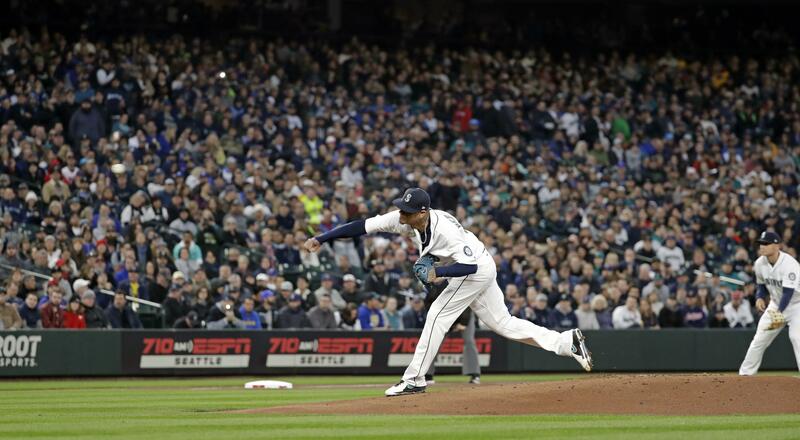 Certainly, Nelson Cruz’s towering homer off Cleveland ace Corey Kluber, Mitch Haniger’s trio of scalded hits, Mike Marjama’s grittiness in an unexpected start at catcher, and Ichiro Suzuki’s return to Safeco Field in a Mariners uniform were some early eye candy. But nothing provided more tantalizing fuel for belief in a more prosperous 2018 than Hernandez. If the King holds a key to the Mariners’ well-being this season, as many – including myself – believe, then this was a tantalizing message that he just might deliver. Not that he had any doubts, mind you. For the past few years, Mariners fans have been waiting anxiously for Hernandez to adjust to the new normal for a power pitcher who has been slowly sapped of his power. Yet whether through injury, the difficult learning curve of a stylistic change, or sheer stubbornness, it had not yet quite taken. The fear, in fact, has been that not only had all of Felix’s overpowering brilliance for so long gone unrewarded with postseason baseball, but he would not be able to come out on the other side in the same fashion as, say, Justin Verlander. Yet there he was on Thursday, having practically willed himself to an opening-day start that was no longer his birthright – and which became further in doubt when he was hit on his pitching arm by a vicious line drive in his first spring start. There he was, exhibiting all the facets that the Mariners have been hoping Hernandez would incorporate into his game. He was efficient, needed just 11 pitches to get three infield outs in the first inning, and seven pitches in the fourth. He disrupted the Indians’ timing, changed speed and eye level, and was overpowering at times, even slipping in a quick pitch to fan Bradley Zimmer in the fifth. Hernandez’s pitching line – 5 1/3 innings, two hits, four strikeouts, two walks, no runs – tells only part of the story. All spring, Hernandez has balked at the talk that he was a diminished pitcher, insisting that he still had it within him to dominate. The Mariners believe that as well, but again, they want him to do it differently. Has a nice ring to it, doesn’t it? But Hernandez admitted that he was playing to the K chants, as ever. Some things may never change for the King. “That’s why I’m always trying to get a strikeout when I get to two strikes,” he said. Yet if the Mariners had a blueprint for Hernandez in 2018, this was exactly what they envisioned. Even better, now Hernandez can see that he doesn’t have to conjure up 2010 with every start, that sometimes less is more, that a one-pitch ground out supersedes a six-pitch strikeout, that he can dominate in different ways. It was a lesson that began to take hold in his last start of 2017 against Oakland, when he wasn’t feeling particularly well, his stuff warming up was subpar, and yet he limited the A’s to two hits and one run in a 7-1 Mariners victory, fanning just two. Was that an epiphany for Hernandez? Was Thursday more reinforcement for the successful transformation of the King? It would be foolish to make any such definitive declarations after one game. Yet this was not insignificant, either. Hernandez’s curveball was so devastating that the Indians had to “look slow,” in Servais’s words, causing them to gaze at many fastballs. His wicked sinker allowed him to get weak contact. It won’t always be like this, he said. “Sometimes, you’re going to have plus stuff and go strike out everybody,” he said. But that’s no longer an every-outing reality for Hernandez, and he knows it. You could tell that Hernandez hungered for this start, his 11th on opening day, 10 of them in a row. That he longed to take the mound in front of a sold-out crowd (at 47,149, the largest in Safeco Field regular-season history), relished the chance to go up against Kluber, who wrested the Cy Young Award that Hernandez thought was his back in 2014. The result was enough for Mariners fans to feel some renewal deep in their soul. Opening day comes accompanied by its own built-in charms, of course, even when it happens at night. Published: March 30, 2018, 3:06 p.m. Updated: April 2, 2018, 4:18 p.m.